Reminder: I have a special giveaway to celebrate June at this link. 7 Heroes you least expect....7 Heroes you'll never forget. When wallflower Audrey Cheswick runs away with England’s most wanted criminal, she learns adventure comes with a price—not just her reputation or her virtue, but her heart. If Ethan Jagger can escape the hangman’s noose and start anew, will she consent to love a scoundrel ever after? Giles Goddard, Lord Norcourt is odd. Odder still, he has suddenly taken a fancy to his brother’s love interest, the fallen Lucy Whitaker. Lucy was once thrown over by a lord and she has little desire to let it happen again, but she’s about to learn that his desires just might be enough for the both of them. Quincy Telford, Duke of Beloin, has hated Viscount Bittlesworth as long as he can remember. Now the man’s daughter is constantly in his path. Can he escape her temptation and avoid peril in the increasingly dangerous game of cat and mouse he is playing with his blackmailer? Season after Season of not being able to secure a wife, Lord Clement's life changes for the better when a beautiful stranger kisses him. Now he has a wife who has it all: beauty, passion, and excitement. But it's not over. Thanks to her tainted past, her newfound love with Perry is threatened when her brother comes back into her life. Can she protect Perry from finding out the truth or will her brother get the upper hand? When Major Bartholomew Blackpool learns the girl-next-door from his childhood will be forced into an unwanted marriage, he returns home to play her pretend beau. He figures now that he's missing a leg, a faux fiancée is the best an ex-soldier can get. He admires her pluck, but the lady deserves a whole man--and he'll ensure she gets one. What’s a colorblind Irishman to do when he’s blackmailed into impersonating a renowned landscape artist, lying to all of London society, and risking the TON’s collective wrath if he’s found out? 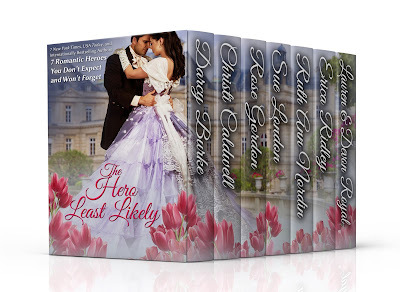 Why, fall for the lovely and unattainable marquess’s daughter next door, of course. But his fetching neighbor is no simpleton and an artist in her own right. When she realizes his ruse, will she expose his misdeeds…or find herself drawn into the hoax? Christi blames Judith McNaught’s “Whitney, My Love!” for luring her into the world of historical romance. While sitting in her graduate school apartment at the University of Connecticut, Christi decided to set aside her notes and pick up her laptop to try her hand at romance. She believes the most perfect heroes and heroines have imperfections, and she rather enjoys torturing them before crafting them a well deserved happily ever after! Sue began writing short stories about horses and teen sleuths when she was seven years old. After that she traveled to distant worlds, fought with swords and sorcerers, and played with a few undead things. As you might have expected, this means she went into accountancy. Well, maybe that was an odd plot twist, but that’s the difference between real life and fiction – fiction has to make sense. Laurel decided to become a writer in the third grade, after winning a “Why My Mother is the Greatest” essay contest. Now she’s a New York Times and USA Today bestselling author of humorous historical romance novels. Lauren lives in Southern California with her family and their constantly shedding cat. She still thinks her mother is the greatest. Thanks for this! amazing group of writers!! All wonderful Authors. Thanks for the opportunity. What a fantastic set! Love these authors and look forward to reading the books.